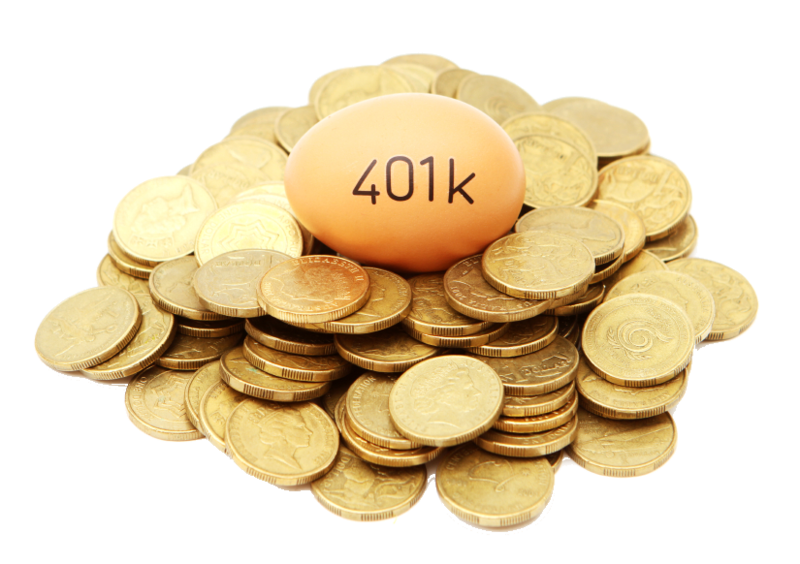 What Is a 401k to a Gold IRA Rollover? Investors can perform a gold IRA rollover to convert some of their existing retirement funds into precious metals (gold, silver, platinum, and/or palladium bars or coins). If executed properly, all assets and new investments retain tax-advantage status. Thanks to the nature of federal regulations of qualified retirement accounts, account holders must follow very specific guidelines when executing a direct 401k rollover to gold IRA. Note that this is not the same as a trustee-to-trustee transfer (in which distributions of existing IRAs are deposited into a new retirement account). 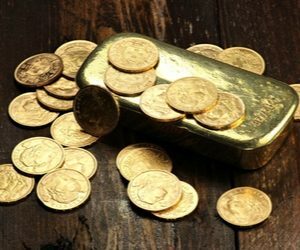 The term “gold IRA” (or, if you see them, “silver IRA” and “precious metals IRA”) always refers to a self-directed IRA that happens to hold physical gold. Unlike traditional IRAs or 401ks, self-directed IRAs allow individual investors to invest in a wide range of assets — including precious metals and real estate — without restrictions from a plan provider. (There may still be restrictions based on your IRA custodian). Most rollovers complete within 10 business days. 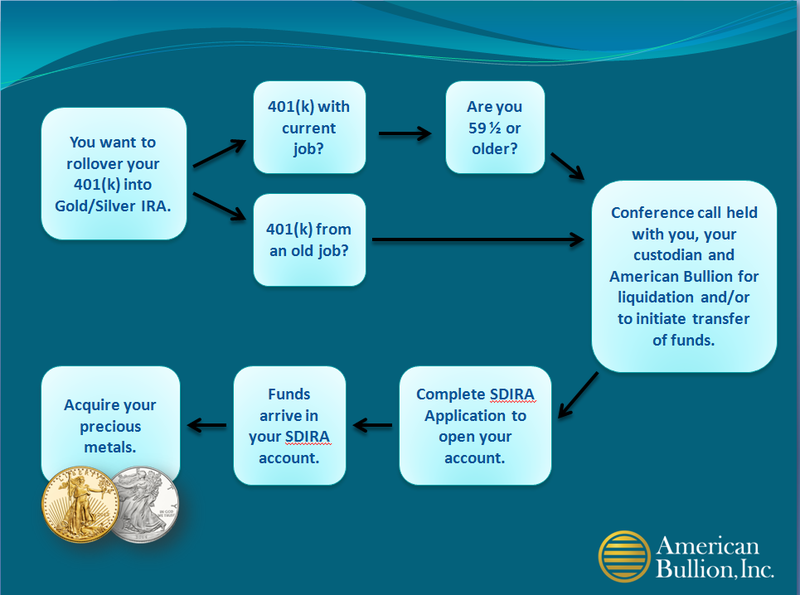 Here is a step-by-step guide to rolling over your current 401K to a Gold IRA. Pre or Post-retirees who wish to add physical gold to their portfolio must follow a specific process to make sure their retirement accounts are qualified to rollover and they are avoiding excessive fees and potential penalties. Not every 401k is eligible for a rollover. Most employees cannot perform rollovers for accounts with their current employer unless they are near retirement age (59 ½). The best time to rollover a 401k to gold IRA is after beginning a new job. Read these FINRA and IRS guidelines to determine if your account is eligible. The easiest way is to call and speak to an account executive at a gold company. The gold IRA rollover process must be executed properly to avoid costly fees and tax penalties. Before you take any proactive steps, generate a list of questions you can’t find answers to and make sure you understand the basics of entire roll over. If necessary, contact couple of different gold companies and choose who you wish to work with, and what metals are available to purchase. Why Roll Over to a Gold IRA Rather Than a Traditional IRA? 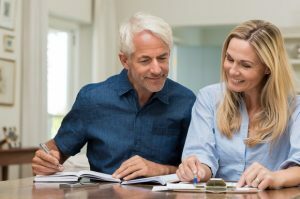 While pre-retirees will likely get more investment choices out of a traditional IRA than a traditional 401k, even traditional IRAs and Roth IRAs do not allow for the breadth of options available to investors in self-directed IRAs. Pre-retirees may not hold physical investment assets, such as IRS-approved gold or silver bullion, in a traditional IRA. Gold is a financial asset. What makes gold and other precious metals unique is its value does not depend on credit, the stability of fiat currency, or the operational decisions of large corporations, unlike stocks, bonds, and mutual funds. Generally speaking, most investors who add gold into their gold IRA accounts do so to mitigate the volatility and downside risk of the stock market, uncertainty around the world, as well as to preserve some of their wealth in a way that politicians or corporations cannot affect easily. You may be shocked to learn how poorly U.S. stocks have performed compared to precious metals since 2000. Let’s say you had invested $100,000 in January 2000 in the NASDAQ Index, your portfolio would be worth only $142,494 in January 2017. Or, let’s say you had the same money in the S&P 500 Index. Your investment would have made about 63%! That same $100,000 investment would have yielded a portfolio of $420,689 in Gold, and $326,666 in Silver. In other words, a 420% and a 326% increase respectfully! You can roll over any portion of your 401(k) balance into gold or other precious metals. As much as you are able to, aim for long term security through precious metals and diversification with other assets. The U.S. government does not allow individuals to execute qualified retirement account transfers — such as a 401k to gold IRA rollover — on their own. You need to find a reputable and established gold dealer, who can help you with all the paper processing and purchasing the gold for your newly established Self-directed Gold IRA. This is required to open and fund your self-directed IRA. It’s best to speak with a knowledgeable representative for this step. The safest, quickest, and least expensive method is through e-Signing and virtual paperwork by getting a help from a gold broker. After submitting the Self-directed IRA account and it is done properly within 24 hours you will receive an account number. Your invoice for new account set up and storage fees will follow. Once your rollover is completed, your funds from your 401(k) is sent to the your new IRA company. From there you request the amount of the funds to be wired to the gold company to purchase your metals. Your precious metals will be all IRA permissible which is picked by a help from an account executive / gold broker at the gold IRA company. Important: You will not physically handle or store your gold. 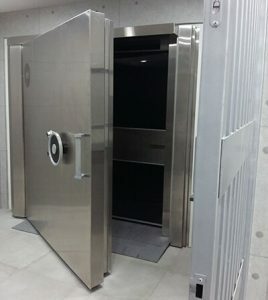 Your metals must be stored at an IRS approved depository, selected by you and your custodian, to ensure safekeeping. After completing your gold purchase on the phone with the gold company, you will receive an email confirmation, in many cases less than an hour, showing the details of your purchase. If you see any discrepancies on that transaction record, within 24 hours you need to call the gold company and get it corrected.